President Pranab Mukherjee paid floral tributes to A P J Abdul Kalam, former President of India on the occasion of his birth anniversary at Rashtrapati Bhavan on Saturday. President Pranab Mukherjee on Saturday paid floral tributes to former head of state A P J Abdul Kalam on his birth anniversary. Kalam, who was the President between 2002 and 2007, died on July 27, last year. 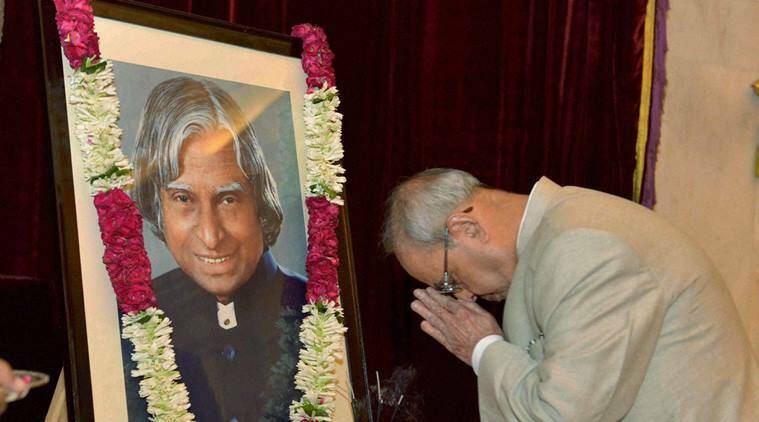 “Mukherjee paid floral tributes to A P J Abdul Kalam, former President of India on the occasion of his birth anniversary at Rashtrapati Bhavan on Saturday. “Officers and staff of Rashtrapati Bhavan along with family members of Kalam also paid floral tributes on the occasion,” a press release issued by Rashtrapati Bhavan said.